I live in an area of our country that has a lot of “Keep Christ in Christmas,” signs. I think people post these signs for all sorts of reasons: for fear that Christmas has become too secular and lost its focus on the birth of the Christ Child; out of resistance to Christmas becoming a consumerist holiday; as a defensive response to what feels like a mandate to be “politically correct,” (i.e. saying “Happy Holidays!” instead of “Merry Christmas!”). Many of these arguments make sense to me. I myself have a hard time explaining to my five-year old why Christmas is both the celebration of Jesus’ birth and the day Santa Claus comes. I too feel lured in by the advertisements that want me to spend more money than I have in order to show my love and affection. I too want to be fully Christian, not wanting to minimize my faith in order to honor others’ faith. In fact, it was not until I moved to a community with a large Jewish population that I really had to think about whether my “Merry Christmas!” greeting was even appropriate. But here is my issue: when I see those (sometimes very large) signs posted all around town, they do not sound like a gentle reminder or encouragement to return to our Lord. When I see them, I feel like someone is shouting at me, “Keep Christ in Christmas! !” Those signs do not feel well-intended, encouraging, or uplifting. They seem angry, defensive, and off-putting. They make me feel like I am guilty and should be ashamed of something. And if I, as a priest in the Church, feel criticized, judged, and reprimanded by the signs, imagine how someone feels who knows very little about the Church. A meme has recently been floating around that helped me identify what it is that is so off-putting about the normal “Keep Christ in Christmas” sign. The sign says, “Want to keep Christ in Christmas? Feed the hungry, clothe the naked, forgive the guilty, welcome the unwanted, care for the ill, love your enemies.” The quote comes from Steve Maraboli, and I think his words get at my struggle. What I like about this quote is that it does not just describe how to reclaim a holiday. This quote describes how to live as an authentic Christian, to live like Christ, in the midst of this holiday. That is a much more powerful witness to me than simply insisting people keep Christ in Christmas. Perhaps instead of saying “Keep Christ in Christmas,” our message could be, “Be Christ this Christmas.” When we busy ourselves with being Christ to others it is a lot easier to remember the reason for the season – no fussing and finger-wagging necessary. This Advent has been a both-and experience for me this year. There have been some incredibly joyful moments: watching my daughter’s excitement about picking a Christmas tree, reading devotionals from our Advent calendar and enjoying my daughter’s insightful comments, and anticipating some fun time with family over the holidays. But there have also been some sobering moments: grieving the loss of my husband’s grandfather, keeping vigil at the bedside of a longtime parishioner and then burying him this week, and listening to stories of neighboring families who are struggling to make ends meet and who are dreading the disappointment of their children when Christmas comes. In some ways, the sobering moments have been hanging heavily for me. That reality has felt normal because Advent is meant to be a quieter, penitential season of preparation. But the lows have felt really low, and I have found myself longing for the highs – or at least some sense of joy. That is why I am looking forward to two upcoming events at St. Margaret’s. First is the third Sunday of Advent. This Sunday is known as “Gaudete Sunday.” Basically, Gaudete Sunday is meant to offer a break from the penitential themes of Advent, instead emphasizing the joy of the coming of the Lord. For a full explanation about the name and origin, look here. This year, I am finding myself longing for Gaudete Sunday, needing more of the joyful moments like I mentioned above and less of the hard moments that keep coming my way. I am grateful for the Church’s gift of respite to us of this Sunday. Oddly enough, I am also looking forward to our Blue Christmas service coming up in a little over a week. The service is meant to be for those who find Christmas to be a difficult or challenging time. Given that I was just saying I wanted a little more joy, it may sound funny that I am looking forward to this service. But the truth is, I am looking forward to sharing some of my Advent grief and sadness with others. Being able to acknowledge those feelings in the context of worship and have them affirmed seems like a tremendous gift. I suppose that is both the nature of Advent and life – times of highs and lows, joys and grief, eager anticipation and dread. My hope is that if your Advent is taking on that both-and shape, you might lean on the Church to help you navigate that experience, and to find companions on the journey. Come join us for a holy Advent. This sermon was delivered on the occasion of our Annual Meeting. This time of year, I do a lot of preparing. Though the setup takes a lot of work, I particularly love preparing our house for Christmas. Unpacking and hanging all the ornaments is a tradition I shared with my family, and that I now can share with my girls. I love telling my oldest daughter the stories behind certain ornaments and helping her decide where they should go. I also put out our international crèche collection. They remind me of travels I have made or friends from far away places. Each inspires something different in me, reflecting the culture and artistry of different countries. And of course, my daughter loves helping me hide away the baby Jesuses until Christmas day. We even take down some artwork on our wall to make room for the cards which friends from far and wide send to us. There is something homey and comforting about the whole process of preparing for Christmas, and I love the way that the preparation makes me feel grounded and joyful. In our Old Testament lesson today, the text says, “prepare the way of the LORD.” In this season of Advent, we are to prepare for the arrival of the Christ Child. Now certainly, unpacking ornaments, advent wreaths, and crèches are one way to prepare. But God is talking about a different kind of preparation today. God is not talking about an outward change – like decorating our homes. God is talking about an inward preparation – an inward change in anticipation of the LORD. I am reminded of how one of our parishioners just recently prepared himself for the LORD. Several weeks ago, one of our young parishioners decided to receive his first communion. He prepared by reading about the Eucharist at home with his family, asking questions, and talking with them about their experiences. He worked on memorizing the Lord’s Prayer, so that he might fully participate in the prayer life of our community. And then he sat with me as we walked through the Eucharistic liturgy, talking about what each part means, why that part is significant, and what all those crazy things on the altar are called. Finally, he chose someone to present him before the entire community, where he and we all declared that he was prepared to be in full communion with this community. He waited and worked to prepare himself for the consumption of our LORD. And now, each week that I have placed the body of Christ in his hand since then, I have felt a sweet, deeply abiding satisfaction when he reaches his hands toward me to receive Christ’s body. The kind of preparation that our young parishioner did is a small taste of the kind of preparation God calls for in our Old Testament today. Isaiah says that in order to prepare, we need to make straight in the desert a highway for our God, lift up every valley, make low every mountain and hill, level the uneven ground, and make plain the rough places. This passage is so familiar to us, that many of us miss the magnitude of what God is saying. When was the last time you tried to fill in a valley or level a mountain? Of course, God is not telling us to literally take the winding roads of deserts and make them straight. But in the metaphors, God is telling us that preparing for God is not easy work. In fact, preparing for the LORD is a monumental task. Preparing for the LORD is not like preparing our homes for Christmas, where we can make a basic checklist and slowly check the items off the list. When given the hefty work of preparing ourselves inwardly for God, the task of leveling our valleys and mountains and smoothing out our rough places is much more difficult. In some ways, I have watched St. Margaret’s do a lot of this interior work. Over the course of the last year, our Vestry and Buildings and Grounds Committee have made level the mess that had become our Undercroft. Though taking on an expensive project, they together worked to clean out harmful mold and mildew, solved a drainage problem to prevent that kind of damage again, and reimagined how that space could be utilized by us and our community. Meanwhile, our educational offerings have been totally made low in this last year. We revamped our Sunday School program after years of struggling to find the best way to raise our children in the faith. We reworked our worship schedule so that adults could claim an hour in their busy lives to ponder their faith and make straight paths in the desert. We have filled in the valleys by marching in parades, sponsoring baseball teams, eating pancakes at local diners, and inviting total strangers into our midst so that they might help us fill in those valleys. Of course, anyone who knows St. Margaret’s also knows that you are only a stranger here for about one Sunday before our wonderfully welcoming community has made sure they know your whole life story before your coffee cup is empty. All of those have been wonderfully positive things in our lives, but not easy work. I cannot tell you the number of people who worried and fretted over our Undercroft expenses, complained about how long the work was taking, and questioned the wisdom of the work. I cannot tell you the number of times I myself considered whether we should halt educational offerings altogether due to low turnout. I cannot tell you how many times I needed each one of us to invite someone to church and instead heard someone say, “Oh, well isn’t that what our new website is for?” We have been making progress toward straightening paths, filling in valleys, and leveling mountains. But we have also gotten very dirty, been impatient and frustrated with each other, and sometimes have dropped our shovels altogether. That is what happens when you do this kind of preparation for the LORD. The work is not easy. The work is monumental. The work is, well, work. And work is what God is inviting us into today. The good news is that today’s text is one of those “both-and” texts. [i] Yes, God is inviting us into some hard work today. As we reflect on another year of service, at the mounds of dirt we have already moved, God is charging us to roll up our sleeves and keep digging. And yes, God promises that the work of preparing will not be easy work. But God also makes a promise while we are in the mire of making roads straight. Our text today from Isaiah says, “He will feed his flock like a shepherd; he will gather the lambs in his arms, and carry them in his bosom, and gently lead the mother sheep.” This last sentence has been lingering with me this week. Maybe because I am a nursing mom, or maybe because this is the only time that scripture talks about the work of a mother sheep, but I find myself riveted by these words. Just this week, I had one of “those” nights at our house. I do not know whether she was teething or just had a rough day, but I lost count after the fifth time I woke up to my infant’s crying one night. The next morning, I woke up bleary-eyed, almost falling asleep while eating my morning cereal, spilling my coffee on my computer, and generally having a rough time trying to focus. That is the life of a mother with young children. And I assume, the life of a mother sheep is not much easier – constantly using her body to protect and feed her lambs. To that wearied mother sheep, God says that God will gently lead her. In fact, not only that, God will gather up her lambs, embracing them in God’s bosom, and then God will gently lead the mother sheep. I am reminded of the many times someone has scooped up my daughters when they were losing their cool. I am reminded of the individuals who have forced me to go take a date night while they watched my kids. I am reminded of the encouraging words and sympathetic nods I have received over these last five years. That is the kind of care God promises us in the midst of our work. God says, “Go out there and get dirty filling valleys, leveling mountains, and straitening roads. And when you are weary from the work, I will scoop up your little ones, and gently lead you by my side.” As I look forward to the coming year, I hear both a charge and a comfort for us today. We all have more to learn, more people to serve, more spreading of the gospel to do. But we also have a shepherd who tenderly encourages and comforts us – and then kicks us right back into the ring. Thanks be to God! Amen. [i] George W. Stroup, “Theological Perspective,” Feasting on the Word, Yr. B, Vol. 1 (Louisville: Westminster John Knox Press, 2008), 28. To see me now, you might not guess the initial reluctance I experienced with using a cell phone. My progress was slow from owning one at all, to learning to text, to using a smart phone, to now using my agile phone. Part of my reluctance was what such usage would mean – being able to be reached at all times; work emails invading “down time,” making me feel like I am never truly off; decreased patience with others who are not as technologically savvy; and constant usage for everyday needs. I still try to resist looking at my phone constantly – I put it down during dinner time, I try not to respond to emails on my day off, I sometimes wait to look up something until I am at my computer. But I still have those moments when my daughter impatiently waits while I finish one quick text or email to someone. Though I ask her to hold on while I finish, I worry that I am becoming what I feared. But there are also days when I am really grateful for my phone. I currently have a parishioner who in the last stages of life. The family and I know that the parishioner could go at any time, and so we are keep watch, spending time together, and holding each other in prayer. I am keeping my phone especially close, checking for texted updates or for the dreaded call. I even keep my phone on my nightstand in case I need to run to the hospital overnight. That may sound unpleasant to some, but what I have come to see these last few weeks is that my phone is becoming not just a tool for pastoral care (a way for parishioners to reach me for emergencies), but it is also becoming a tool for my prayer life. When I check my phone and there are no messages about this parishioner, I use the moment as a reminder to pray – pray for the parishioner, the parishioner’s family, and talk with God about the hard stuff of life. 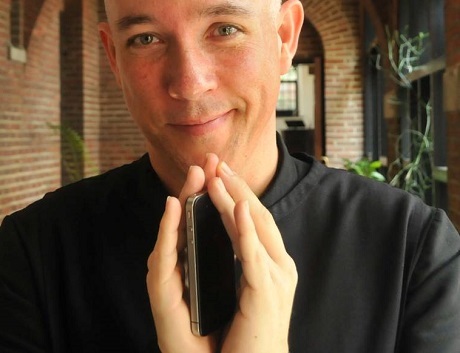 Who would have thought that this little phone – a thing which I had once associated with menace, annoyance, and disconnectedness – could also be a tool for deep connection, prayer, and blessing? Courtesy of http://episcopaldigitalnetwork.com/ens/2014/11/12/anglicans-invited-to-celebrate-advent-using-your-camera-phones/ Check out their website for a concrete way of using technology this Advent! What I love about this tiny revelation is that it points to a larger truth. God is constantly working through us in the current age. It may sound silly, but I think God can work through our technology – through my little cell phone – for good, inviting me back into relationship with God, and working through it to connect us to one another. The trick is keeping a watchful eye for God when it could otherwise be easy to miss God. Of course, that is not a new problem. God has been inviting God’s people into relationship from the beginning of time – and we have regularly been resistant. The trick for staying connected is finding those things that help us return to the LORD: whether it is a cell phone, a strategically placed Prayer Book that reminds us to pray, a set of prayer beads that you keep in your pocket, or a regular commitment to church attendance. I wonder what things in your life might be repurposed to help you reconnect with the holy this week. I live a very loud life these days. If any of you have ever visited the Rectory between the hours of five and seven in the evening, you have witnessed the sheer volume of my life. Between the baby who can only communicate frustration through crying and the kindergartner who is quite verbose nowadays, mixed in with the fatigue they both feel after a long day of school and nursery care, let’s just say these hours are full of a lot of noise. That is not to say that all of the noise is unpleasant – there is also the noise of laughter, storytelling, and shaking rattles. But our house in those hours is not the place where you would want set up a yoga mat and try to meditate. I sometimes blame all the noise in my life on my beloved children. But the truth is I am as much a cause of the noise as they are. I am admittedly loud myself – whether barking instructions around the house, singing aloud, or simply talking my husband’s ear off. But I am not just loud in the house – I am also loud inside my head. My mind is in constant conversation: my to-do list, searching for ideas for a blog post, worrying about a sick friend or parishioner, trying to make plans for the weekend, processing a troublesome conversation, or wallowing in guilt for missed exercise or time in prayer. As loud as my outside world is, my inside world is probably much worse. Add Christmastime to the mix, and the loudness of my life reaches levels that can be incapacitating. That is why I love Advent so much. In the lead-up to Christmas, the outside world bombards us with noise: Christmas songs on the radio, shopping to complete, parties to attend, gifts to wrap, houses to decorate, gatherings to host, cards to send, and loud relatives or friends to entertain. In contrast, the Church at this time asks us to do the exact opposite: slow down, take a breath, light some candles, breath in the fresh greenery, sing quiet, meditative songs, and worship in the soothing purple of anticipation. When the outside world is telling us, “Do more, buy more, run more, fuss more, stress more,” the Church says, “Do less, worry less, run less, talk less, be busy less.” The contrast between the two worlds is like night and day, and at a time of high stress, Advent becomes the Church’s greatest gift to us. Into this contrast, we hear words from Mark’s gospel today. The text says, “Beware, keep alert; for you do not know when the time will come. It is like a man going on a journey, when he leaves home and puts his slaves in charge, each with his work, and commands the doorkeeper to be on the watch. Therefore, keep awake– for you do not know when the master of the house will come, in the evening, or at midnight, or at cockcrow, or at dawn, or else he may find you asleep when he comes suddenly. And what I say to you I say to all: Keep awake.” Many of us hear this text today with a sense of anxiety – of needing to keep anxious watch for the Lord. We might imagine the many apocalyptic movies, predictions, and preachers we have witnessed over the years and wonder whether Jesus really does want us to be more alarmed. Certainly the outside world would have us also be alert and anxious for the coming Christmas. But I think the Church is saying something else today. Instead of an anxious alarm, our gospel lesson sounds like a gentle reminder to me. Keep awake, for you do not want to miss the quiet beauty of Advent. Keep awake, for you do not want to miss the gift of time set apart in these four weeks. Keep awake, for you do not want to miss the lead in to the manger, the dramatic retelling of why the manger is so important, and the grounding for this entire season. [i] Jesus’ words for us to “keep awake,” are not meant to be one more anxiety to pile on top of a mound of concerns. Jesus’ words for us to “keep awake,” are meant to help us focus on what is really important. So make a commitment to come to church each Sunday in Advent and spend those Sundays in quiet worship with your church family. Grab an Advent calendar or devotional to help you more intentionally mark the days leading up to the manger. Or set up that Advent wreath at home, so that you might bring the quiet candlelight of prayer and meditation to your home. Whatever the discipline, choose something this Advent that will help you maintain the quiet peace you find here at Church and carry that quiet peace throughout your weeks leading up to Christmas. My guess is that noise of life will slowly fade into a quiet hum in the background – which is right where it should be. Amen. [i] Lillian Daniel, “Pastoral Perspective,” Feasting on the Word, Yr. B, Vol. 1 (Louisville: Westminster John Knox Press, 2008), 22. One of the funny things about being a priest is the way that everyday people interact with me. The funniest experiences occur when people first find out I am a priest. I love seeing the raised eyebrows or hearing the stammers as someone panics about any inappropriate things they might have said in the first ten minutes of our conversation. Parties with strangers or our children’s school gatherings are always fun as people try to figure out how they should modify their behavior in front of me. In fact, many of my single and dating priest friends have avoided the conversation altogether about what they do for a living, hoping that the other person will get to know them for who they are, not just what they do. There really is a sort of cultural divide that I forget about until I get in one of these situations and then have work with someone to create a sense of comfort and commonality. That cultural divide is no more obvious than on a holiday like Thanksgiving Day. Today we gather to celebrate what is mostly a secular holiday. This day has become a day about an abundance of food, watching parades and football, enjoying fellowship with friends and family, and post-turkey naps. This is a day of giving thanks for the good things of life, but often in a secular way. I know many people who have a tradition of going around the table and saying something for which they are thankful. But those things are usually listed without a mention of God. In fact, the non-specific nature of gratitude this day is what makes it a perfect day for interfaith groups, like our own Plainview-Old Bethpage Interfaith Group, to celebrate – because we can all recognize in our own different ways our gratitude and thanks. But for us Christians, this day is a little different. We may do all the same activities: feast, fellowship, and fun; but we also root those activities in gratitude toward God – the source of all our blessings. For us, today is not just a day to be grateful for the good things in life, but to be thankful to God for our blessings. That may sound like semantics, but I think that, especially today, our language matters. So we can still go around the table listing our blessing, but we also acknowledge that God is the source of those blessings. We can still enjoy a feast, but we begin our meal in a prayer that thanks God for the bounty of the earth, the hands that touch our meal in its many stages, and for the privilege and pleasure of good food. We can still watch the game or the parade, but we are grateful to God for the blessing of shelter and the disposable income to afford that television and cable service. And we can still enjoy the company of friends and family because we know that God blesses us with companions on our journey. So why does our naming God today matter? What difference does our calling this a sacred day have to do with anything? The difference is that when we name God in the midst of blessing, there is a “so what?” attached. Our epistle lesson says today, “God is able to provide you with every blessing in abundance, so that by always having enough of everything, you may share abundantly in every good work.” In other words, when we give thanks today, that is not the end of the story. When we give thanks today, God is well pleased. And God also expects us to share that abundance with others. As the epistle says, our blessing is not strictly for us. Our blessing is given to us so that our blessing might be a blessing to others. And that is why we mark this day as a sacred day. Because if Thanksgiving Day is simply a secular day of being grateful, the day begins and ends with us – our experiences, our gratefulness, our happiness. But if we celebrate Thanksgiving Day as a sacred day, then the day may begin with us, but the day ends with others – our blessings overflowing to bless others. That is the true abundance of Thanksgiving Day. The abundance cannot be contained. In fact, our epistle lesson says that the more we pass along our abundance, the more that abundance grows, “The one who sows sparingly will also reap sparingly, and the one who sows bountifully will also reap bountifully.” So, go home and enjoy all the blessings of this day – and then share those blessings bountifully. Amen.